Denbies’ Vineyard in Dorking, Surrey, provides a fascinating day out, not just for the wine enthusiast, but for all the family. 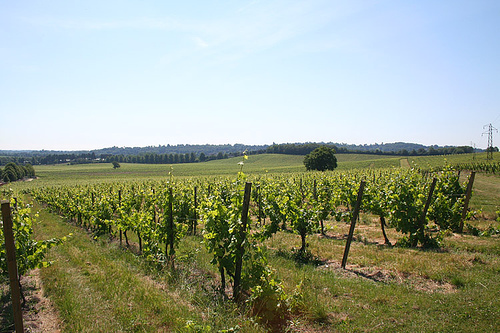 Set in the Surrey Hills, there are miles of public footpaths trailing through the vineyard that you can take advantage of. Denbies is a family run business and they are actually one of the largest wine producers in the UK. Denbies Estate covers 627 acres, a third of which is woodland. There are ten estate houses and 265 acres of vineyard have been planted, making it the largest in the UK. The estate is named after John Denby who owned the property in the 18th century. Since then, the property has changed hands several times. There are plenty of different wine tasting tours to choose from, including the ‘Gin and Vine Experience’ and the ‘Wine and Food Tasting Experience’. Tours range from one hour to an all-day event, but advanced booking is recommended. The Classic Wine Tour starts with an introductory video in their brand-new cinema where you can learn about the history of wine. You will then be guided through the working winery and end the tour in the Denbies cellars. There are various packages to choose from when booking an outdoor tour with Denbies, ranging from a 50-minute train ride that allows you to experience panoramic views of the breath-taking scenery, to an afternoon tea package that is perfect for a relaxing summer’s day. Different packages have different times of availability, so again, make sure you book ahead. The Gallery Restaurant is open for lunch and evening meals and overlooks the 265-acre vineyard. The set menu here is seasonal and all food is locally sourced where possible. You can also book wine tasting and wine pairing experiences. The Conservatory Restaurant is just as it suggests – it is set in a huge conservatory filled with tropical plants, fish, and water features. Locally sourced produce is also served here and it is open for breakfast, lunch, and afternoon tea. Children are catered for with a ‘pick n mix’ bar so they are able to choose from a wide selection of dishes. The Village Green Farm shop at Denbies is open seven days a week. Here you can purchase seasonal vegetables that have been grown without artificial chemicals inside a Victorian walled garden. You can also buy fresh bread, ice cream, and artisan chocolate here. The gift shop is also open all week and offers a wide variety of gifts, home interior accessories, jewellery and stationery. The shop is open from 9.30am until 5.30pm Monday to Saturday and 10 am until 5.30pm on Sundays. If you are travelling by car, you will need to take the M25 and exit at Junction 9. Follow the A24 and take the third exit at Denbies roundabout onto Bradley Lane. From London, take the A3 and then journey towards Dorking via the A24. You can also reach Denbies via train or bus, as the estate is only a fifteen-minute walk from Dorking Station.